Phidias or Pheidias (; Greek: Φειδίας, Pheidias; c. 480 – 430 BC) was a Greek sculptor, painter and architect. 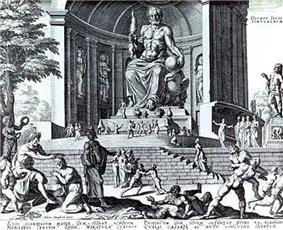 His statue of Zeus at Olympia was one of the Seven Wonders of the Ancient World. Phidias also designed the statues of the goddess Athena on the Athenian Acropolis, namely the Athena Parthenos inside the Parthenon, and the Athena Promachos, a colossal bronze statue of Athena which stood between it and the Propylaea, a monumental gateway that served as the entrance to the Acropolis in Athens. 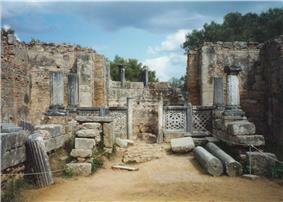 Phidias was the son of Charmides of Athens. The ancients believed that his masters were Hegias and Hageladas. Plutarch discusses Phidias' friendship with the Greek statesman Pericles, recording that enemies of Pericles tried to attack him through Phidias - who was accused of stealing gold intended for the Parthenon's statue of Athena, and of impiously portraying himself and Pericles on the shield of the statue. The first charge was disproved, but Phidias was sent to prison for the second, where he died. Pericles' companion, Aspasia, was also accused of impiety and of keeping a disorderly house, but was acquitted of the charges against her. Ancient critics take a very high view of the merits of Phidias. What they especially praise is the ethos or permanent moral level of his works as compared with those of the later so called "pathetic" school. Demetrius calls his statues sublime, and at the same time precise. In 447 BC, the famous Athenian statesman, Pericles, commissioned several sculptures for Athens from Phidias to celebrate the Greek victory against the Persians at the Battle of Marathon during the Greco-Persian Wars (490 BC). Pericles used some of the money from the maritime League of Delos, to rebuild and decorate Athens to celebrate this victory. 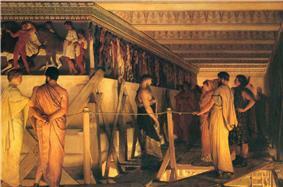 In 1958 archaeologists found the workshop at Olympia where Phidias assembled the gold and ivory Zeus. At the site, there were still some shards of ivory as well as moulds and other casting equipment, and a black glaze drinking cup engraved "I belong to Phidias". The Golden Ratio has been represented by the Greek letter \varphi (phi), after Phidias, who is said to have employed it. The Golden Ratio is an irrational number approximating 1.6180 which has special mathematical properties. The golden spiral is also said to hold aesthetic values. 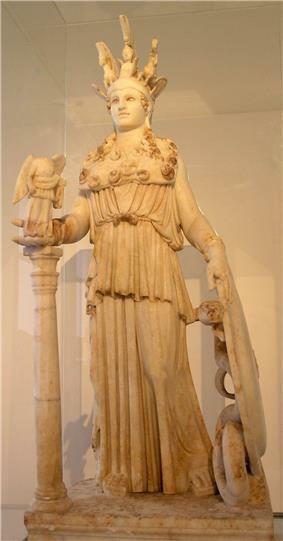 For the ancient Greeks, two works of Phidias far outshone all others, the colossal chryselephantine figures of Zeus (c. 432 BC) which was erected in the temple of Zeus, at Olympia, Greece, and the Athena Parthenos (literally, "Athena the Virgin"), a sculpture of the Greek virgin goddess Athena named after an epithet for the goddess herself, which was housed in the Parthenon in Athens. Both sculptures belong to about the middle of the 5th century BC. A number of replicas and works inspired by it, both ancient and modern, have been made. 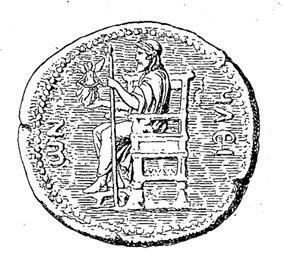 From the late 5th century BC, small copies of the statue of Zeus found on coins from Elis, which give a general notion of the pose and the character of the head. The god was seated on a throne, every part of which was used for sculptural decoration. His body was of ivory, his robe of gold. His head was of somewhat archaic type: the bust of Zeus found at Otricoli, which used to be regarded as a copy of the head of the Olympian statue, is certainly more than a century later in style. In antiquity Phidias was celebrated for his statues in bronze and his chryselephantine works (statues made of gold and ivory). In the Hippias Major, Plato claims that Phidias seldom, if ever, executed works in marble, though many of the sculptures of his times were executed in marble. 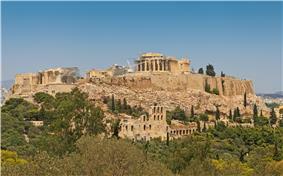 Plutarch tells us that he superintended the great works ordered by Pericles on the Acropolis. Inscriptions prove that the marble blocks intended for the pedimental statues of the Parthenon were not brought to Athens until 434 BC, which was probably after the death of Phidias. It is therefore possible that most of sculptural decoration of the Parthenon was the work of Phidias' workshop including pupils of Phidias, such as Alcamenes and Agoracritus. Our actual knowledge of the works of Phidias is very small. 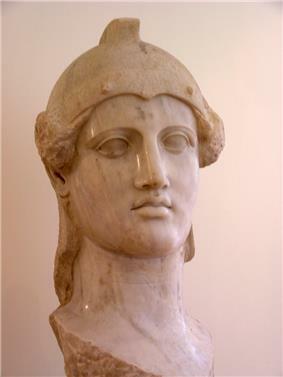 There are many stately figures in Roman and other museums which clearly belong to the same school as the Parthenos. These are copies from the Roman age. According to geographer Pausanias (1.28.2), the original bronze Lemnian Athena was created by Phidias (c. 450-440 BC) for Athenians living on Lemnos. 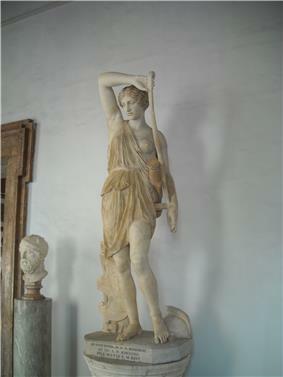 Adolf Furtwängler suggested that he found a copy of Phidias's Lemnian Athena in a statue of which the head is located in Bologna and the body is at Dresden. Some 5th century BC torsos of Athena have been found at Athens. 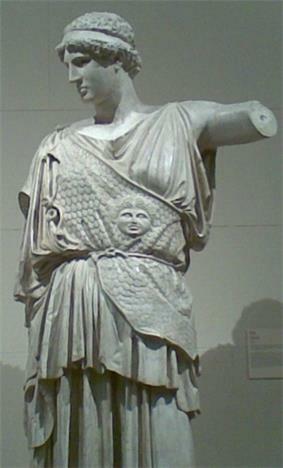 The torso of Athena in the École des Beaux-Arts at Paris, which has unfortunately lost its head, gives some idea of what the original statue may have looked like. 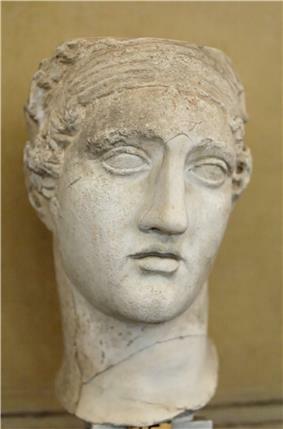 A significant advancement in the knowledge of Phidias' working methodology came during 1954–1958 with the excavation of the workshop at Olympia where Phidias created the Statue of Zeus at Olympia. Tools, terracotta molds and a cup inscribed "I belong to Phidias" were found here, just where the traveller Pausanias said the statue was constructed. The discovery has enabled archaeologists to re-create the techniques used to make the statue and confirm its date. ^ "Replica of The Hémicycle". ^ The golden ratio can be derived by the quadratic formula, by starting with the first number as 1, then solving for 2nd number x, where the ratios (x + 1)/x = x/1 or (multiplying by x) yields: x + 1 = x2, or thus a quadratic equation: x2 − x − 1 = 0. Then, by the quadratic formula, for positive x = (−b + √(b2 − 4ac))/(2a) with a = 1, b = −1, c = −1, the solution for x is: (−(−1) + √((−1)2 − 4·1·(−1)))/(2·1) or (1 + √(5))/2. ^ Statue of Zeus from encyclopædiabritannica.com. Retrieved 22 November 2006.